“They gave him a bath and dressed him in a uniform and then handed him a gun. “And now you are ready” they said. “Ready for what?” said my grandfather. “Why, ready to go and shoot,” they said. “And who am I going to shoot?” my grandfather wanted to know. “Why, the enemy, of course,” they said. “And who might that be?” asked my grandfather. It is a small extract from the story “The man they could not draft” by M.Quin. Seeing what is going on in Egypt these days there appeares a desire to penetrate into the mind of a soldier and understand what he feels while killing unarmed civilians. Whether he feels pity for them, whether he considers them terrorists and is eager to terminate them, does he despite them or he kills only because he has to perform the order. Does he ask himself the same questions which the main character of the story mentioned above asked? The was a case in my country twenty years ago. A policeman was forced to go to Moscow to protect the Government House from demonstrators in 1993. The situation in the country was unstable and he knew that he might use weapon against people, people who were fighting for their rights. So the policeman refused. He left the police service and explained to his management that he would not shoot people, his compatriots. 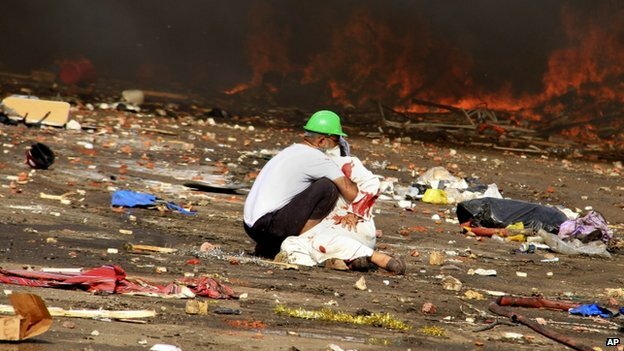 I see the events in Egypt and the pictures break my heart. Soldiers killed civilians, burned people alive, attacked not only demonstrating men but also women with children, snappers worked cold-heartedly. As a result there are thousands of dead and injured. There are parents who will never see their sons and daughters, widowed wives and orphaned children. Egypt will not forget this day! The bloody day when army took lives of more than 2000 innocent people under the flag of fighting terrorism (where is terrorism here?) Yet there are people who justify this action of military government blaming the victim not the criminal. "And if you obey most of those on earth, they will mislead you far away from Allah's Path. They follow nothing but conjectures, and they do nothing but lie."